It’s already a week into the New Year and the long Chicago winter has kicked in. Several inches of snow and negative wind chills are predicted for the next few days. The temperature drops below 0 in the morning and makes the snow seem like concrete. This is when I suspend bicycle commuting and try to occupy myself while waiting for the snow and ice to disappear. This biking hibernation can last for a few days all the way into March. 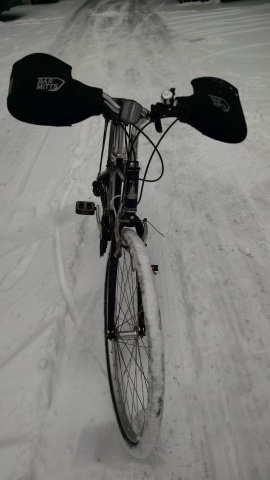 If possible, I will bicycle around the neighborhood for fun or to nearby stores if road conditions are safe, but I give myself a break from the grind of bike commuting. Exercise: If you count running outside to throw away the trash in the alley and walking quickly to avoid being in the cold as exercise then yes. I actually don’t do much physical activity outside of bike commuting. I do workout videos during times when I really feel like a lump of lard, and those are on rare occasions when I have time and am motivated. People have told me to purchase a bike trainer, but with no room to put it, I’d rather just wait until it’s safe to bike in the cold. I received some Bar Mitts as a gift for Christmas, and it certainly cuts down on the wind chill while biking. I tried these in below freezing temps and it definitely makes your hands more comfortable. Daydream about a new bike: When the snow totally covers the ground I often want to purchase a fatbike just so I can go on the lakefront and ride on the snow and sand. I also picture myself in the summertime riding around in a nice dutch cargo bike hauling groceries. Cook more: With so much more time freed up, winter means cooking indoors and trying out new recipes. It also means eating more and fattening up, but after a whole year of biking, it’s OK.
Read: Sometimes it is just nice to relax and catch up on a few books I haven’t had the chance to read. One book I’m reading now is Cycling Home from Siberia by Rob Lilwall. Catch up on Sleep: Probably the biggest thing I neglect and I know is not healthy is the amount of time devoted to sleeping. Typically when I bicycle commute, I only get around 6 hours of sleep. When I’m not on the bike I get a luxurious 8 hours of sleep and I am super awake. There you have it. I am a normal person and have realized to let myself relax and let my body rest during the cold months. Last year when the winter was so bad, I found that relaxing and keeping my mind busy was the best way to prevent myself from going crazy.